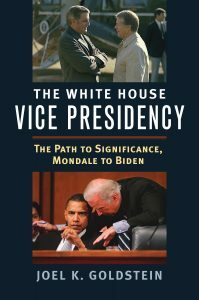 Joel K. Goldstein, author of The White House Vice Presidency: The Path to Significance, Mondale to Biden, analyzes the difficulties Trump must deal with in choosing a vice presidential candidate for the 2016 election campaign, in an article in Sabato’s Crystal Ball. Among those challenges is Trump’s lack of established relationships with Republicans from the four feeder groups: senator, high national executive branch official, governor, or member of the House of Representatives. In USA Today Joel K. Goldstein, author of The White House Vice Presidency, a new book about how the office and role of VP has grown in importance in recent decades, reviews the numerous possible strategies and candidates for a Trump running mate: insider/outsider?, male/female?, current politician/former politician?, governor/senator?